A heart-warming, tender junior novel about family, love, loss and home by the author of the wonderful When the Angels Came. Griffin Silk is an uncommon sort of boy, from an uncommon sort of family. The warm, loving home he shares with his father, grandmother and five big sisters (The Rainbow Girls) is marked by the aching absence of his mother and baby sister. Where have they gone and will they be coming home again? When Griffin starts school and meets Princess Layla the answers to his questions gently start to unfold. This unique, tender novel will captivate young readers and adults alike, with its warmth, honesty and beauty. 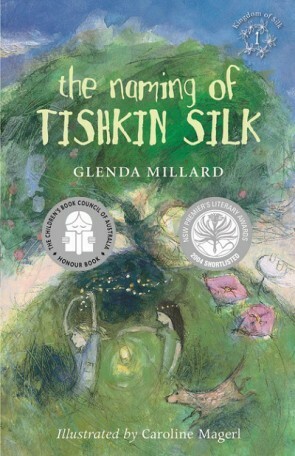 Honour Book in the 2004 Children’s Book Council of Australia Book of the Year: Younger Readers Award. Also shortlisted for the 2004 NSW Premier’s Literary Awards (Patricia Wrightson Prize). Click here to read more about Caroline Magerl. Glenda Millard was born in the Goldfields region of Central Victoria and has lived in the area all her life. It wasn’t until Glenda’s four children became teenagers that she began to write in her spare time. She has been writing full-time since 1999 and has published several books for children. Her first book with Walker Books Australia, Isabella’s Garden, has been awarded Honour Book in the Picture Book of the Year category in the 2010 Children’s Book Council of Australia Awards, and has won a Speech Pathology Australia Book of the Year Award, Best Book for Language Development, Lower Primary Category (5–8 years), 2010; and shortlisted the Queensland Premier’s Literary Awards Children’s Book Mary Ryan Award, 2010. Caroline Magerl was born in a small German town near Frankfurt and came to Australia when she was two. Soon after, in a suburban Sydney backyard, her parents built a yacht which became a home and way of life. Until Caroline was fourteen, the family sailed the east coast of Australia. At sixteen, Caroline joined another yacht, crossing the Tasman Sea to New Zealand. After the return voyage she worked as a cook, painting in her spare time. Caroline now works as an artist, illustrator and printmaker and received an ASA children’s picture book illustrators’ grant to work on Hasel and Rose. She has exhibited widely overseas and in Australia.